Cassini data on the slight wobble in the orbital motion of Enceladus backs up the idea that the ocean beneath its ice is global, a body likely kept liquid by tidal energies as the moon is pulled and squeezed by Saturn in its orbit. The same process is likely the cause of the cracks that allow ocean water to escape into space, from perhaps as many as 100 sites on the surface. Image: The Cassini spacecraft detected hydrogen in the plume of gas and icy material spraying from Enceladus during its deepest and last dive through the plume on Oct. 28, 2015. This graphic illustrates a theory on how water interacts with rock at the bottom of the moon’s ocean, producing hydrogen gas. A Goddard team wants to develop an instrument that would reveal even more details about the hydrothermal vents and perhaps help answer if life exists on this ocean world. Credit: NASA/JPL-Caltech/Southwest Research Institute. The GSFC team is using NASA R&D funding to increase the spectrometer’s sensitivity in the 557 GHz range, where the strongest signal from water is to be found. 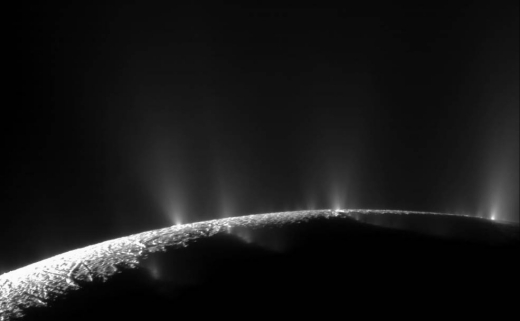 The goal is to explore the entire system of surface vents on Enceladus, measuring water and traces of other gases. The work also includes creating a radio frequency data-processing system, and a digital spectrometer for the RF signal that will convert it into digital signals to allow the measurement of the gases emerging from the plumes in terms of their quantity, temperature and velocity. Calling it “one of the most ambitious submillimeter instruments ever built,” Chin says in this NASA overview that SELFI should be able to detect and analyze 13 molecular species, ranging from water in various isotopic forms to methanol, ammonia, ozone, hydrogen peroxide, sulfur dioxide, and sodium chloride. Work on the instrument is sufficiently encouraging that the GSFC team believes SELFI will eventually be part of a proposal for a future mission to Saturn. Image: Dramatic jets of ice, water vapor and organic compounds spray from the south pole of Saturn’s moon Enceladus in this image captured by NASA’s Cassini spacecraft in November 2009. Credit: NASA/JPL-Caltech/Space Science Institute. Assuming it flies, the instrument should allow us to deduce the composition of the global ocean, and its potential for hosting extraterrestrial life. We have no idea whether Enceladus has warm hydrothermal vents of the sort that sustain life at the bottom of Earth’s ocean, but the prospect is enticing not only for this moon but for many of the other icy moons in the outer Solar System. On the subject of Saturn, be aware as well of an interesting mission possibility called Hera, proposed as an M-class mission led by the European Space Agency, with collaboration from NASA (thanks Mike Fidler for the tip). The plan here is to detach an atmospheric probe from a ‘carrier-relay’ spacecraft as it approaches Saturn, letting the Hera probe enter Saturn’s atmosphere to study its tropopause, descending to pressure levels of at least 10 bars. The primary science objectives will be addressed by an atmospheric entry probe that would descend under parachute and carry out in situ measurements beginning in the stratosphere to help characterize the location and properties of the tropopause, and continue into the troposphere to pressures of at least 10 bars. All of the science objectives, except for the abundance of oxygen, which may be only addressed indirectly via observations of species whose abundances are tied to the abundance of water, can be achieved by reaching 10 bars. The Hera proposal recalls two previous missions, the first being the Galileo probe that was carried aboard the main Galileo spacecraft to Jupiter, entering the Jovian atmosphere on December 7, 1995 and continuing to function for close to an hour as it descended. The other analog is, of course, Cassini carrying the Huygens probe for the spectacular 2005 landing on Titan. That was a collaboration between ESA and NASA that paid off handsomely, and it provides a model for the carrier/data relay spacecraft model that Hera would use. Given the tremendous advance in drone technology, wouldn’t it make more sense for a gas giant atmospheric probe to be a long duration drone, instead of a capsule that just falls through the atmosphere until it reaches its crush depth? Multiple approaches are feasible; A hot hydrogen dirigible would be one approach. Perhaps better would be a sailplane navigating the boundary between an upwelling and downwelling area. Or a quadracoptor operating exclusively in an upwelling area; You could pull power off the props in such an environment, avoiding the politically charged nuclear approach. The point is that a long duration drone would have the opportunity to take extensive photos and readings, and time to upload the results, and then could still do a suicide dive into the lower atmosphere. What would you power the dirigible? The sailplane might work if it could reliably find updrafts to ensure it kept aloft. But again, what small, lightweight power supply could be used that could keep operating for as long as the sailplane was aloft? Parachuting multiple probes into the atmosphere seems the best way to sample a column, whilst a balloon with an RTG might be the best way to sample a layer horizontally over long distances. In the hot hydrogen dirigible case, the hydrogen would be heated by the waste heat from a nuclear isotope battery. A sailplane operating in an area with good updrafts can extract power from a propeller, at the expense of a reduced glide ratio. With stronger updrafts, a helicopter can do the same and remain aloft. Jupiter’s atmosphere is known to have some serious vertical wind speeds in upwelling regions, I assume the same is true of Saturn. One advantage of gas giant atmospheres is that the circulation patterns are very large scale and persistent. And, with the high wind speeds, there’s a fair amount of energy available to tap. I would like to know how measuring the 13 species of molecules fully characterizes the Enceladus ocean and could indicate life. Is there a document that explains how this works? Good question. Let me see what I can dig up from the SELFI team. Agree Brett, an instrument of longer duration should be proposed ()Drone vs capsule) and at the same time a sample return from Enceldaus, utilize aerogel etc. Gotta start pushing the envelope a little, both seem feasible. I’ve seen various proposals for sample-return missions for the Enceladus plumes, is there any serious momentum behind any of them? I guess there’s the problem of preventing any samples from degrading during the multi-year travel time from Saturn back to Earth, so I can see why an in-situ experiment might be preferred. These SNAP mini-probes could, in a manner similar to that of the Pioneer 13 (Pioneer Venus Multiprobe) mission, “bracket” Saturn with several simultaneously-descending atmospheric probes, which could transmit their data to an orbiter for relay to Earth. It would also be useful if each probe carried a “push broom imager” (such imagers are ideal for use on spin-stabilized probes and spacecraft), as they could characterize the cloud morphology and optical density, and even–*if* they exist–document the existence of any macroscopic airborne life forms (a long shot to be sure, but we’ll never know if we don’t look). In addition, “endo-atmospheric” pictures showing the rings and moons would have great inspirational and public relations value as well as scientific utility. Enceladus may be an attractive target to search for life with the fact that it is spewing samples of its subsurface ocean far into space all the time, but let us not forget that first global ocean moon, Europa – especially now since it may have plate tectonics! And while getting samples from Enceladus may be relatively simpler, let us not forget that Europa is 400 million miles closer than that Saturnian moon. 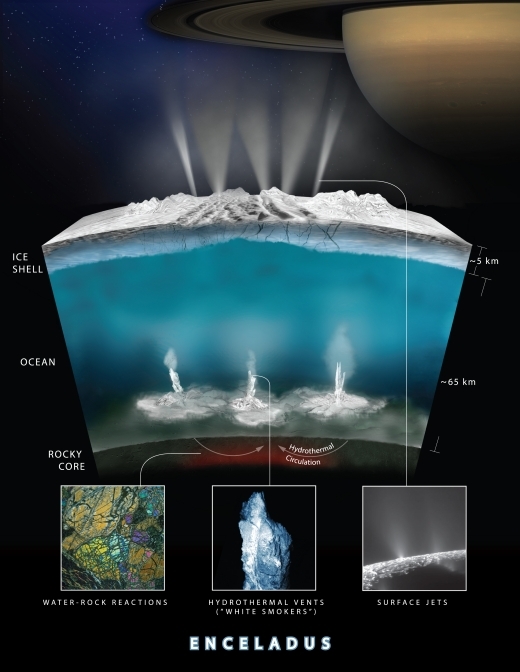 This reminds me: what’s the latest on whether or not there are plumes on Europa similar to the ones on Enceladus? And are they predictable enough to do a sample-return mission? Space Week 2017 and Science Week 2017 merged in a flurry of drawing workshops. Hundreds of children took part in Spectacular Cassini at Saturn. The workshop was of course inspired by the sublime images taken by the spacecraft as well as telling the story of the mission. Because I could not go to a shop and buy a Cassini spacecraft or a Huygens probe I made my own models. Saturn and is rings was also part of my project so I made a model that could fit in my car. It had to be light and looked reasonably like the planet itself. In my experience having a model of the subject in the classroom really helps to engage children in the subject. In almost all of the workshops the children asked to hold the spacecraft. That was fine with me but resulted in the communications dish , main engines and thrusters falling off from time to time. A repair kit of glue and replacement parts became part of the many boxes in my car during the months of October and November. A Langmuir probe, developed in Sweden and flown to Saturn on the Cassini spacecraft, has made exciting discoveries in the atmosphere of the planet. Jan-Erik Wahlund at the Swedish Institute of Space Physics in Uppsala and his colleagues show that there is a strong coupling, both chemically and electrically, between the atmosphere of Saturn and its rings. These research results have now been published in the well-respected journal Science. Immense northern storms on Saturn can disturb atmospheric patterns at the planet’s equator, finds the international Cassini mission. This effect is also seen in Earth’s atmosphere, suggesting the two planets are more alike than previously thought. Inverse has reached out to NASA to find out where the CDA might be right now. According to a post the agency wrote about the instrument back on December 22, it expects that the CDA cover is traveling in an “Earth-like orbit” with an “approximate speed of 19 miles per second (30 kilometers per second).” It may be bright enough to be visible with a very powerful telescope, but so far, NASA hasn’t been able to confirm that. And although the Huygens Titan lander is technically a separate system from Cassini, it was carried all the way to Saturn by the big probe and is currently nice and frozen on the surface of that strange alien moon. Just how long will Huygens remain there intact, by the way? Will it be frozen for eons, or does Titan have enough shifting to eventually destroy the lander in some manner?